When selecting a perk, below the passive benefits, you see your starting loadout. I suggest that players be able to click there, opening a new menu they can use to configure these parts of their loadout, allowing some nice new options. New tier 1 weapons would add more variety and choices to the early game, but to make them most worthwhile to add to the game, they need to not only be available in the shop, but also available to spawn with, since many players are only interested in tier 1s that can be had for free, saving their dosh for progressing beyond. In the new menu, available options of starting tier 1 weapons for usual perks would include their original tier 1, tier 1s crossperking to their perk, future new tier 1s for their perk, and an option randomizing between the prior options. 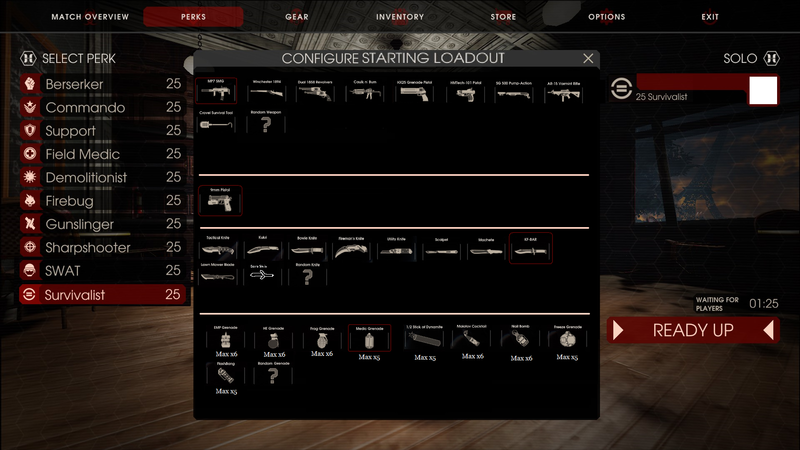 Instead of being stuck with a randomized tier 1, survivalist could use this new menu to choose any tier 1 weapon that he wants to spawn with. This would make survivalist much more appealing to spawn as, for many players. Randomized is still an option, though. Usual perks only have one grenade type available, but this new menu could make exceptions to that possible. For example, Demolitionist could choose between keeping his on-contact stunning dynamite, or using a new chain reaction grenade, which would detonate from either a long fuse, or by being hit with another explosion, allowing combo explosions much like KF1's grenades. If there's a randomization option for grenades, it should probably just randomize once per spawning, not once per throw. Instead of having one or two grenade types available as a side effect to a couple of his skills, survivalist could approach grenades with the same characteristic freedom he buys weapons with: everything available. Grenades aren't all equal in utility, and for their original perks, that's fine, other strengths can balance that. To somewhat equalize them for survivalist's use, survivalist should get his max grenade carry number adjusted by type chosen. For the excellent mednades, he gets the usual maximum, 5, while he would get the consolation of a sixth max grenade if he picked something not so great. Alternatives to the 9mm Beretta could be made available for selection through the new menu. The new menu could allow alternatives to the knives to be added. For example, a night stick could be available with inferior damage to the knife, but with superior reaction effects, like some stun power. Picking other perks' knives would be kind of pointless, especially now that he has his own goreshiv, but maybe this could be available anyways, just to truly maximize survivalist's "use anything" theme. Damn I'd love to see this become an actual thing. Spawning in as Survivalist is always such a gamble.